Q: What are the differences/similarities between the film and the novel? 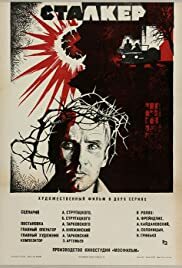 The characters at the heart of Tarkovsky's "Stalker" are people who embark on an arduous journey only to discover that they had no idea what they wanted to gain from it. The central character is a "stalker," a man who makes a living by illegally escorting people through a restricted area to The Room, a place where their greatest wish will supposedly come true. Exactly why the area is restricted is never made perfectly clear; in the novel this film is partially based on, "The Roadside Picnic," it was a site where aliens briefly landed, and The Room was an object they left behind almost as if it were refuse. But Tarkovsky would rather not settle for such a flat explanation. To him, The Room is a place that means different things to the people who journey there, and the stark, ravished landscape they must journey through consists of the phobias and anxieties that they can hardly bear to face. The expedition the men experience is a long and often maddening one, and there are many scenes where the camera lingers on a beautifully composed shot so that the viewer can take time to understand how the characters fit into the settings and how those settings form both natural and supernatural obstacles. Andrei Tarkovsky was an artist who did not like giving solid answers to the questions his films posed. He sculpted his stories so that viewers who had the patience and self-discipline to stay attentive all the way through could draw their own conclusions. If there is any specific meaning to "Stalker," it is that we have to fully understand anything for which we are willing to alter our lives. 142 of 180 people found this review helpful. Was this review helpful to you?